Hemarthrosis is bleeding in a joint that can occur because of conditions such as hemophilia, physical trauma, or other causes. It is often suspected because of the pain, swelling, and joint stiffness it can bring about, which takes weeks or months to resolve. Treatment is essential since lengthy exposure to blood can damage the cartilage of your joints. A variety of conditions can cause hemarthrosis. It can begin after a joint injury or it may develop spontaneously if you are prone to bleeding. Trauma: A major joint injury, strain, or tear can cause rapid bleeding into one or more of your joints. Bleeding disorders: Hemophilia, a hereditary disease in which the blood does not clot properly, is associated with a tendency to experience hemarthrosis. While hemophilia is the most common bleeding disorder, there are several bleeding disorders that can make you prone to excessive bleeding as well. Blood thinners: If you are taking blood thinners such as aspirin or anticoagulants such as warfarin, you may be susceptible to bleeding in any part of your body, including your joints. You can bleed spontaneously, but typically, bleeding occurs in as a result of mild to moderate trauma. 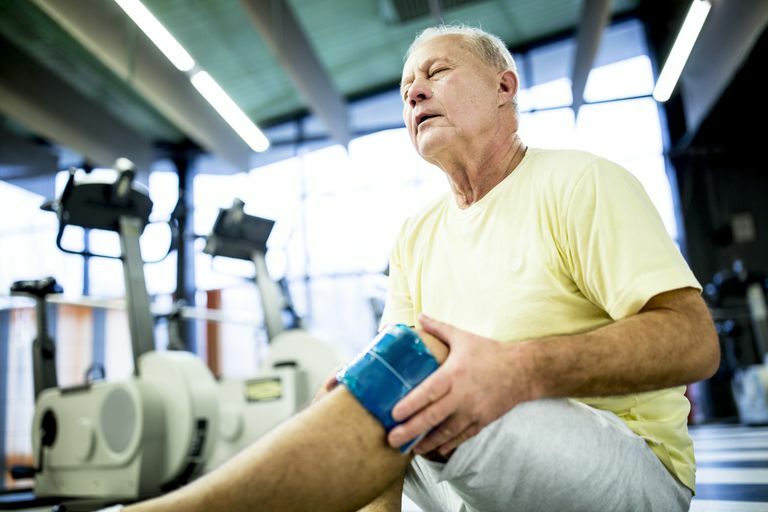 Osteoarthritis: Osteoarthritis, often associated with a degenerative flap tear in the meniscus (a protective covering of your joint), can result in bleeding into a joint. Surgery: Sometimes, surgery can cause complications such as bleeding into a joint. Neoplasms (cancer): Cancer may disrupt the blood vessels in a joint. Additionally, a tumor may develop its own blood supply, which can include fragile blood vessels that can easily tear or bleed, resulting in hemarthrosis. Signs and symptoms of hemarthrosis can range from mild to severe and are generally worse if there is a large amount of bleeding. While it's wise to bring any such symptoms to your doctor's attention, it's especially so if you are particularly at risk for this condition. If allowed to progress, hemarthrosis can inflame and thin cartilage, causing pain, weakness, degenerative arthritis, or additional bleeding into the joint. In severe or prolonged cases, the condition can result in permanent changes in joint structure and function. Your doctor can usually identify the condition by visually examining your joints. When you have pain and ​swelling in a single joint (monoarticular), hemarthrosis is considered as a possible cause. Imaging studies may also be helpful in identifying blood in and around your joint. Joint aspiration (arthrocentesis) can offer a definitive diagnosis. Your doctor will insert a needle into your joint, collecting a sample of joint fluid. The fluid will first be analyzed visually by your doctor and may also be sent to the laboratory for full analysis. The joint fluid that is associated with hemarthrosis is typically reddish, pinkish, or brownish. Other characteristics of the joint fluid may help identify the underlying cause of your hemarthrosis. Treatment for hemarthrosis depends on the cause and may include simple at-home remedies, medication for relief of pain and swelling, removal of the blood, and/or medication to prevent bleeding. RICE: Resting and using ice, compression, and elevation (RICE) is often used for the management of pain and swelling. Avoiding blood thinners: Many over-the-counter pain medications, such as Advil (ibuprofen) and Aleve (naproxen), are also blood thinners and can exacerbate bleeding. Do not take any pills for pain relief unless recommended or prescribed by your doctor. Joint aspiration: For large bleeds, joint aspiration may be done within two days of the bleed to prevent damage that the blood can cause in the joint. Surgery: Synovectomy (removal of joint lining), meniscectomy, and osteotomy have been used for the treatment of hemarthrosis. Another technique, known as ablation, provides debridement (careful removal) limited to the diseased tissue. Physical therapy (PT): Tailored therapy, designed to use your joints while avoiding overuse or damaging motions, can help you recover and prevent deformities. PT may be the only therapeutic intervention you need, or it may accompany joint aspiration or surgery. Electrical therapy with transcutaneous electrical nerve stimulation (TENS) has been used for pain control with limited success. Blood clotting medication (prophylactic blood clotting factors) may be recommended as a preventive measure if you are at risk of developing hemarthrosis due to hemophilia. In general, blood clotting medications can be dangerous, potentially inducing blood clots that can cause strokes or heart attacks. These drugs can prevent bleeding, but not remove blood. You will only receive blood clotting medications if you have a bleeding disorder, and you will be closely monitored for complications if you receive this treatment. Hemarthrosis is not a common condition, but it's worth knowing about the potential of it. Mild to moderate joint bleeding should resolve with time. Treatment can alleviate the pain, discomfort, and swelling and can help prevent long-term complications and joint damage. If you have swelling of one or more joints in your body, you should see your doctor. If you experience rapid or severe swelling, you should seek prompt medical attention. Manners PJ,Price P,Buurman D,Lewin B,Smith B,Cole CH. Joint Aspiration for AcuteHemarthrosisin Children Receiving Factor VIII Prophylaxis for Severe Hemophilia: 11-year Safety Data. J Rheumatol.2015 May;42(5):885-90. doi: 10.3899/jrheum.141236. Epub 2015 Mar 1.
van Baardewijk LJ,Hoogeveen YL,van der Geest ICM,Schultze Kool LJ. Embolization of the Geniculate Arteries Is an Effective Treatment of RecurrentHemarthrosisFollowing Total Knee Arthroplasty That Can Be Safely Repeated. J Arthroplasty.2018 Apr;33(4):1177-1180.e1. doi: 10.1016/j.arth.2017.11.002. Epub 2017 Nov 24.